(4) The purpose for the disclosure. The information must be made available to the patient no later than 60 days after their request is received. 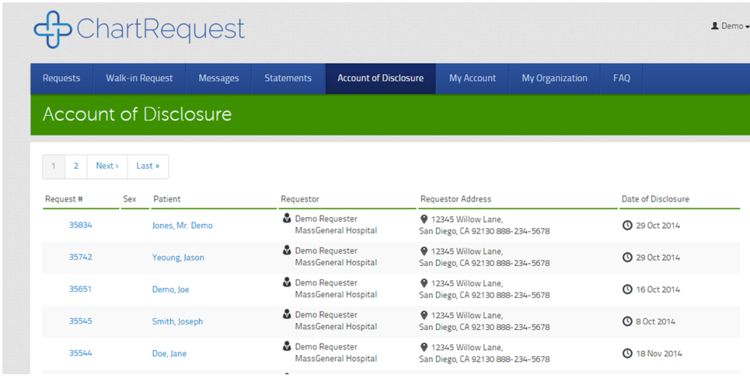 How can you ensure that your practice is tracking medical record disclosures? Well, that’s where the ChartRequest platform comes into play. Our platform automatically creates an Account of Disclosure for every request entered into the system. Click the “Account of Disclosure” tab on your ChartRequest account to view a list of every request entered onto the ChartRequest platform in one convenient location. From this list, the provider’s office can click on the request number to see all of the details regarding any given request. There are many things that go into being HIPAA compliant. This is just another step that we’ve taken to help you manage your risk. If you have any questions regarding our “Account of Disclosure” or “Walk-in Request” features, feel free to reach out to us for more information.